Various objets trouves accumulate on my kitchen windowsill, cheek by jowl with the hybrid Dendrobium orchids and some ceramic acorn squashes which I fashioned myself. There is a piece of lava from Lanzarote, some crystals from the Cantabrians, an ammonite in polished section, and some choice beach pebbles from Tanybwlch. 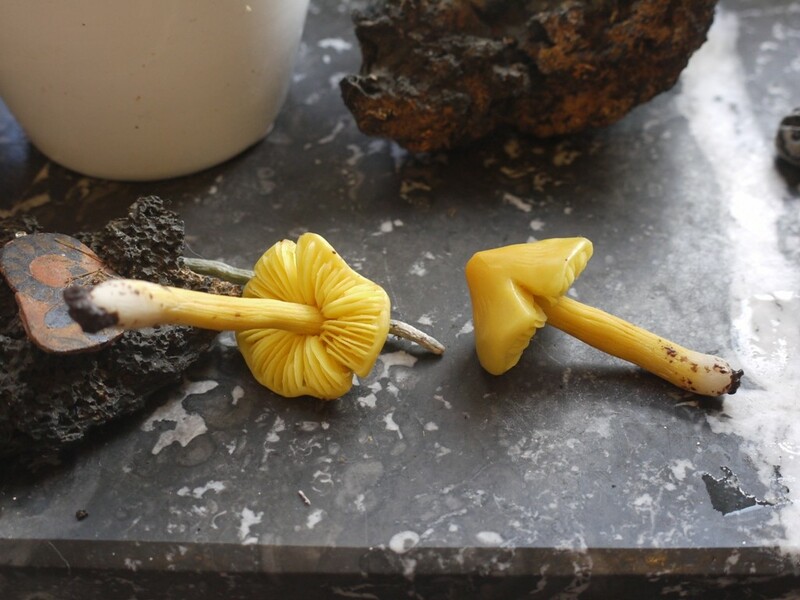 And the latest addition to the medley are two exquisite waxcap fungi, Hygrocybe persistens. Odd you may think. It has been mild this winter, but even so.. This little gleaming mushroom of sheep grazed pastures and and un-improved ancient lawns is a feature of balmy summer and autumn, not the rain-soaked pastures of today. And the explanation is that these Hygrocybe were gathered, not in the field but by a discriminating shopper following the Totterdown Front Room Arts Trail in South Bristol last year. They reached west Wales in Christmas wrapping paper. ‘Polymer clay is a type of modelling clay that doesn’t dry in the air and instead is cured by baking in an oven, typically between 230°F (110°C) and 300°F (150°C). Polymer clay is made from powdered polyvinyl chloride (PVC), plasticizer, binders, fillers, colors, and lubricants. When baked, the PVC particles soften and dissolve into the plasticizer, creating a solid fused mass of plastic. The longer you bake polymer clay, the more complete the fusion will be and the stronger the result.’ I find that Fimo is another brand of polymer clay, made in Germany by Staedtler and was the more familiar name for the product when my children were young. Sculpey is the American equivalent. So my extraordinarily realistic waxcaps are replicated in hard and resistant baked plastic! The texture is impossible to discern without touching, the details so authentic down to the delicate gills, the occasional split in the caps, even the crumbs of dark soil apparently clinging to the stem where they were lifted, as if it were yesterday, from the ground. I am told Jason Lynton has one of his fungi on public display, (possibly at Kew?) 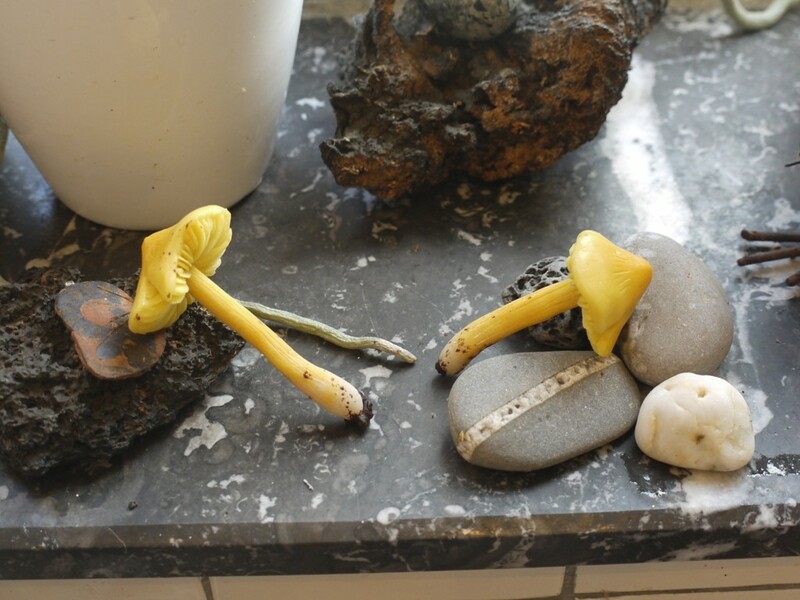 , but for the most part he is industriously working his way through the mushrooms of Britain, even perfecting the ways to reproduce the wet drops of ‘milk’ exuded on the gills of the Milk Cap. A quiet dedication which I find most admirable.